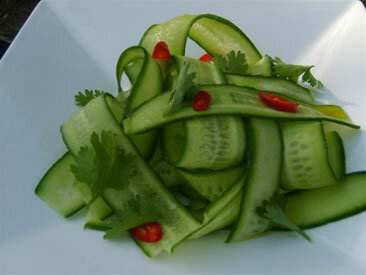 Cut the cucumber into chunky pieces, boil with vegetable stock for 5 minutes, blend and strain finely. Boil the cucumber liquid with half of the agar agar, season with salt and pepper. Boil the cream with the remaining agar agar, season with salt and add the sour cream once liquid is removed from the fire. Pour half of the cucumber liquid into 2 cups. Allow to chill. As soon as the surface is firm enough, add the cream mix. Chill the cups again. Then top with the remaining cucumber liquid. Once the jelly is entirely firm, remove it carefully from the cups. Prepare the tapenade: Mash garlic, black olives, capers, salt and pepper to a paste. 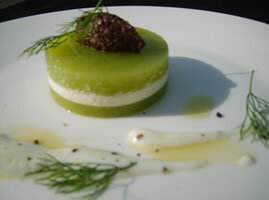 Place a quenelle of tapenade on each bavaroise and garnish with dill and herb oil. Chef Gabi’s Tip: Fresh cucumbers pack a lot of nutrition and provide plenty of “distilled” water and chlorophyll if eaten with their skin. They are an excellent source of the Vitamins A, C, and folic acid. Cucumbers provide also silica, which is a trace mineral that contributes to the strength of our connective tissue. Now is the perfect time to stimulate your system. Getting rid of all the extra pounds gained through the festive days is a good plan after all! I am sharing today one very simple but delicious recipe with you for one of my favorite raw foods. It is a crunchy salad, with fresh ingredients that are very easy to get from the region, full of stimulating flavors and vitamins. Cucumbers: We get beautiful small and crunchy cucumbers here in the UAE. I definitely fell in love with these baby cucumbers, where you can eat everything, even the tiny seeds and the soft skin. Fresh cucumbers pack a lot of nutrition and provide plenty of “distilled” water and chlorophyll if eaten with their skin. They are an excellent source of the Vitamins A, C, and folic acid. Cucumber provides also silica, which is a trace mineral that contributes to the strength of our connective tissue. Ginger: The root is one of the only foods which can increase digestive heat without over stimulating. Chili: Chili’s increase digestive heat and stimulates the stomach secretions. Lime: Limes contain natural anti-parasitic agents and natural bitters which stimulate liver function. A high content of Vitamin C supports our immune system. Coriander: All green herbs act as natural carminatives. Coriander improves digestion, helps to eliminate excess water, and can reduce fevers. Mint: Mint leaves have a cooling effect on the body, strengthen the stomach, defines the skin and is a perfect stimulant. Wash all ingredients. Slice 2-3 small cucumbers lengthwise into thin shavings with the help of a good peeler. Peel also a small piece of ginger and grate it finely (perfect with a micro plane grater, available in good kitchen and home stores). Peel one garlic clove and grate it on the same grater. Deseed one (or a half, if you don’t like your food to be hot and spicy) chili and chop it. Grate the skin of 1 lime with the micro plane grater and press the lime juice. Pick a generous amount of equals mint leaves and coriander leaves. Now mix all ingredients gently, add a little bit of salt and a generous splash of olive oil. Serve the salad immediately after you have prepared it. The cucumbers don’t stay crunchy if they rest in the dressing, and most vitamins are also not resistant to oxygen. The amount of chili is up to everyone’s taste – start careful with a few slices for the first time. Another favorite crunchy cucumber dish is “Cucumber, Quinoa & Feta”. We serve it at Talise Spa, Madinat Jumeirah, and you definitely should try it when you are there! For a refreshing drink just place some fresh mint leaves, one slice of ginger and lime into your glass of water.